We left Saguenay and spent a day at sea doing just what you would expect a sea day to be–not a darned thing. Well, nothing except have a huge fight in the dining room with the maitre d’hotel. Sunday was a formal night, and we did not bring formal clothes. Although I have a tuxedo, I don’t even own a tie. Sportcoat and shirt is as fancy as I have any intention of getting. This meant we could not eat in the main dining room. The pool side grill was open, but eating in the wind and snow was not an attractive option. That left the other restaurant on board, “La Terazza”. In the afternoon I attempted to make a reservation: the concierge said only the restaurant could confirm and they would call me back about 6:30. At 7:15, I called them and was told the only slot open was at 9, which is too late for our little group of early risers. Gail did not take this well, and was expressing her opinions to me vociferously when the restaurant called back and said someone had been summoned to the Captain’s table and we could have their slot right now. Dashing into the room 4 minutes later, we noticed that the place was empty. We were assured people would be swarming in soon. Well, dinner was pretty decent. Then the boss came over to explain why we couldn’t get a reservation until 9, and we pointed out that the room was still empty. Void. Shoot-a-cannon-through-it. He had excuses. We had empty tables to point out. It wasn’t pretty. It made no sense to me. Service on this ship is usually wonderful, occasionally dreadful. Definitely a problem with consistency. In the long run we ended up with a reservation at the fancy, extra price restaurant for the next formal night. I’m not sure it was worth the hassle. Monday we were docked in Charlottetown, Prince Edward Island. I had hoped to meet up with the elusive LCM, a man I have known on the internet for years, but that was not to be. Instead, He has health issues, or maybe he just doesn’t want to meet anyone in person. Too bad, LCM is one of the great characters of the internet. Beth the Travel Goddess arranged a rental car for us and we took our own tour of the island. This church looks like it was created on a Hollywood set. 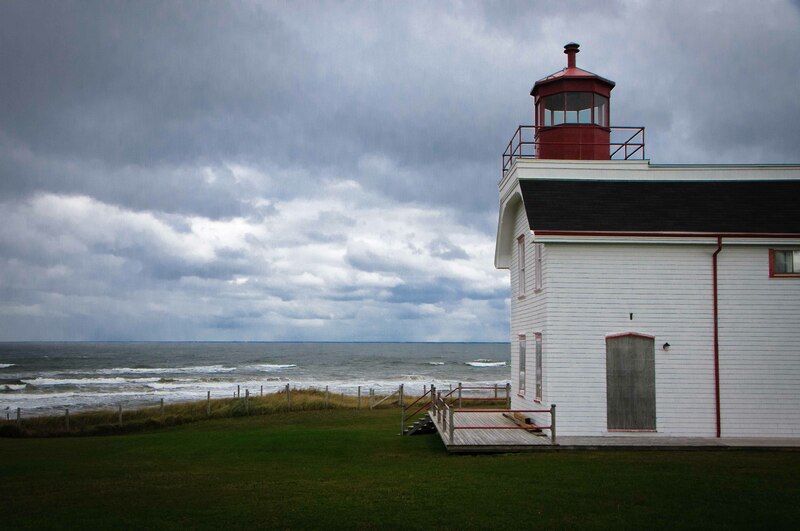 Prince Edward Island (PEI to the in crowd) mostly looks like it came from a picture book. Vibrant colors, picture-perfect farms, cottages and seaside villas are all you see. 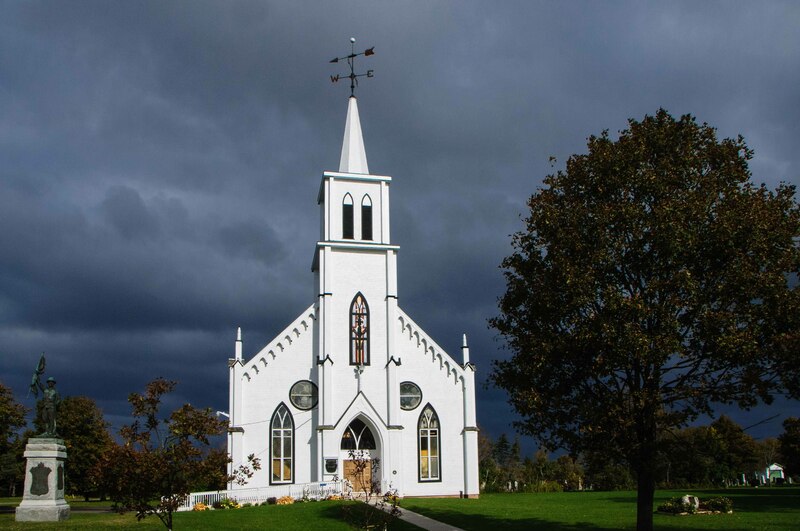 There are many churches, and they mostly all look like the one above, each with its own small cemetery. While the center of the island is agricultural, growing lots of potatoes, the coasts are all summer retreats, opening in May and closing early October. We saw dozens of “closed for the season” signs on hotels, restaurants, gift shops, miniature golf courses and amusement parks. in fact, this island mostly closes down entirely for the bitter, frigid, windy winter. A cab driver told me the farmers and fishermen go on unemployment for the cold months. Heaven only knows how many go to Florida. Not all lighthouses are tall towers. Completing the circuit of the island, we stopped for lunch at what was recommended as the best local seafood. I had a lobster roll, which would have been better on a warm roll. We all had the seafood chowder, which was as good as one could possibly imagine. A woman at the next table ordered the potato salad as her dessert, so I was happy to find it on the plate with my roll. In fact, it was a potato and egg salad the likes of which I’ve never had before. This is an island that know what to do with the spuds they grow. We sailed off from PEI headed for Sydney, Nova Scotia. I suppose there is something there, but I’ll never find out. We slept late and did nothing until lunch, by which time people had come back from their shore excursions mostly exclaiming about how cold they were, not about anything they may have seen. Now were sailing somewhere else. The crew says we’re in for a rough ride, and have dramamine handy for those who want it. I’ll let you know tomorrow, if I’m not leaning over the railing.